New Sleek Design – The modern, lightweight streamlined look matches to any kitchen counter complimenting your kitchen style and design. New Locking Mechanism – With the new stationary latching system, the one snap step offers optimum convenience and an easier way to assemble and disassemble the machine. 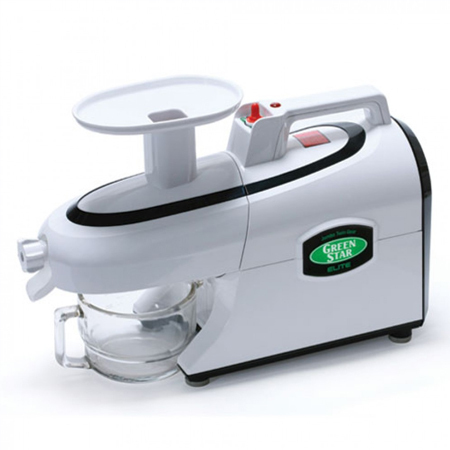 Added Safety – The Green Star Elite Juicer prevents injury by eliminating your chances of interacting with moving parts by including a safety switch system attached to the safety hood, which disables operation when the hood is removed. Easy Clean Up – There are now fewer parts, so there is less to clean. Additionally, the safety hood can be used as a basket to cradle the juicing parts after cleaning, providing you with storage space for drying without taking up any additional counter space. New Easy Grip Outlet Adjusting Knob – The knob has been re-designed to include easy grip ridges so you can easily and quickly grasp, turn and control the pressure inside the machine. You can juice a wider variety of fruits and vegetables of different consistencies. Higher Yields – Designed to maximize the yield and nutritional value of your juice, Advanced Heavy Duty Jumbo Twin Gears extend the juicing process from two to three stages: crushing, mixing and pressing. Increased Versatility – By adding the mixing stage between the crushing and pressing stages, juicing soft fruits is much easier and more effective. Increased Value – By including only the most popular items into one convenient package, there is only one Green Star Elite model and only one optional accessory: the soft fruit outlet adjusting knob. This model comes with all of the basic juicing and food processing attachments. It includes the fine screen to make juice with minimal pulp, and the homogenizing blank for basic food processing. All Green Star models also conveniently include a glass juice pitcher, wooden plunger, plastic plunger, and cleaning brush. Green Star owners expect only the best from Tribest products, making each Green Star machine one of the world’s best juice extractors and most efficient food processors.